Sonic Boom Meets Sun Dog from barbara tomlinson on Vimeo. Video from Kennedy Space Center Apollo Center February 11, 2010. 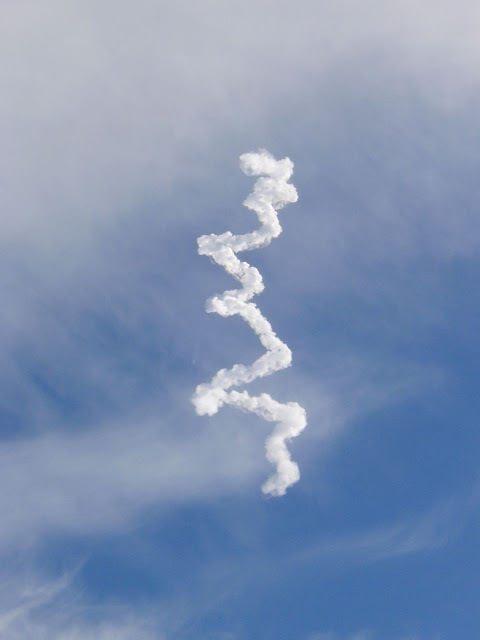 Launch of Solar Dynamics Observatory on an Atlas V rocket. 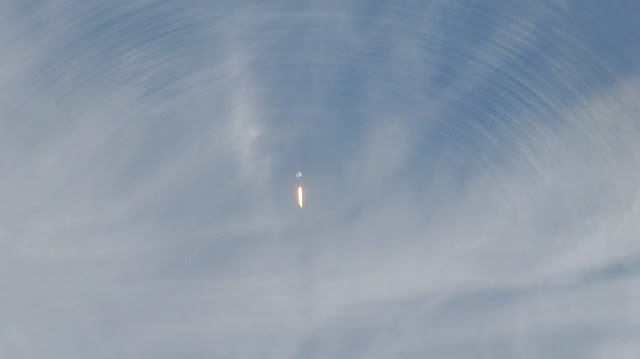 About 1 minute 14 seconds after liftoff the vehicle went supersonic. The shock wave obliterated a sun dog. It was really beautiful, and poetic for this mission. A sun dog or parhelion is a bright rainbow effect in the sky caused by refraction of sunlight through ice crystals. Click the Vimeo icon to view in HD on the Vimeo site. Go Full Screen and set Scaling to Off and it will be optimized. The launch of the Atlas V rocket carrying the Solar Dynamics Observatory was beautiful. I am very pleased with the images I captured with my inexpensive camera. The NASA video on YouTube didn't even show the shock wave. 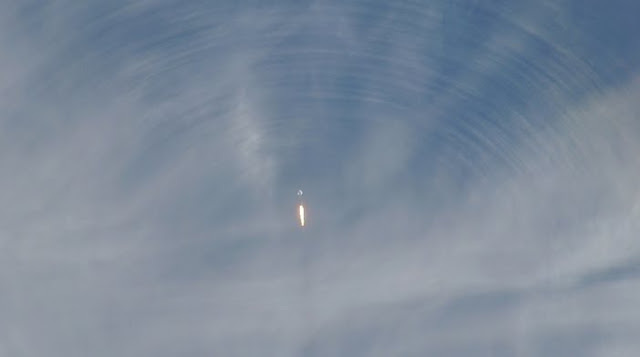 After the sonic boom the rocket went through a layer of the atmosphere with enough moisture to make a nice contrail. Why is it so erratic? I can only guess it was from wind sheer. *Update: Dr. Patronis called me and explained that the rocket exhaust vents are on gimbals and they're constantly adjusting to keep the rocket going straight and true. Of course they are. I'm the Managing Associate of Stuart's Stream Of Consciousness and that video is f-ing COOL!!! Way cool! 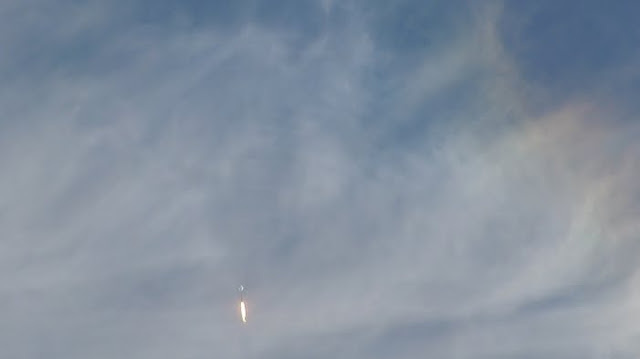 Please post on your blog and facebook a link so we can see what NASA does with your awesome video. Why cant we use these rockets, time tested platforms, to keep our manned space program alive? It seems to me that even some of the shuttle components could be re-used in a less costly alternative, such as the solid rocket boosters, shuttle engines, etc. A capsule can't be 'rocket science' for us to design, after all the technical know-how and experience? Is this thinking too logical or what? Why depend on the Russians when we could still roll our own with what we have and know, even if we scrap the shuttles? The whole situation is deplorable. I was talking about it with a friend who works on the space suit mechanical systems. He pointed out that without the shuttle there's no way to bring things back from the space station. If a space suit pack goes bad they just have to throw it out with the garbage and let it burn up on reentry. There will never be any museum pieces of anything up there, let alone any ability to rebuild something and send it back. Hi Barbara! I was delighted and trully impressed after watching your video. It is amazing to witness such a phenomenom! I can only imagine how difficult it can be to follow a fast object across the sky. Since I work in vfx and took the liberty to use your footage as an exercise to remove shaking and improve it a little bit, so the whole taking off and the boom became better appreciated. I really, really hope you don't mind. If this bothers you please accept my apologies and I will leave this in only that, an exercise. However, if you would like to see the results please contact me so I can send you a quicktime, I didn't find any other way to write you, so I used this blog form. If you follow my profile you'll find my email (I thought it wouldn't be wise to just post it here).